In 1954, two boys stood on stage for the final of The International Wool Secretariat fashion design competition. 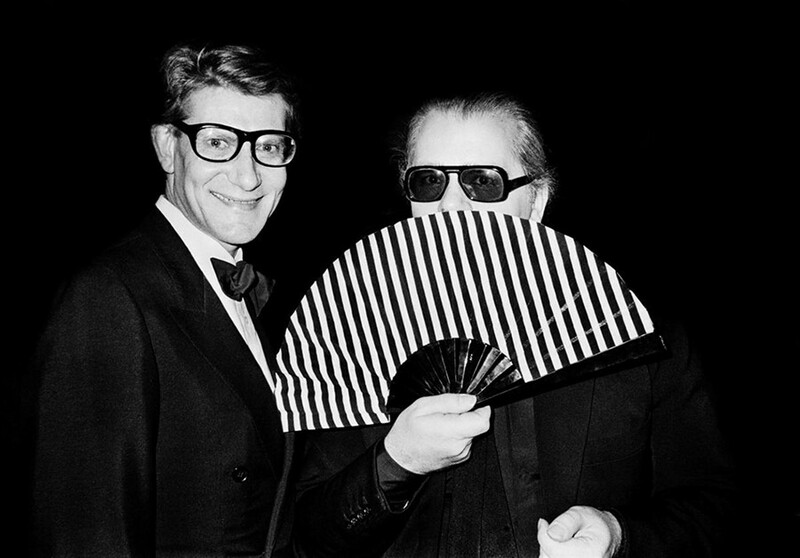 One was the eighteen-year-old Yves Saint Laurent, or Mathieu-Saint-Laurent as he was then known, who scooped the prize for best dress, while the other, Karl Lagerfeld, aged twenty-one, was crowned winner of the coat category. The competition, which had the objective of promoting wool within fashion, was only in its second year at this stage, armed with a jury panel which included Hubert de Givenchy and Pierre Balmain. Karl’s winning coat was daffodil-yellow and cut low across the collarbone, while Yves Saint Laurent’s cocktail dress enveloped the shoulders in a seductive black sheath. “A dress too dazzling to wear twice,” was the designer’s tagline. From this moment, the pair would become rivals, working and socialising in parallel success throughout the liberating and hedonistic world of 1960s. Together they would shape and re-define the world of haute couture and Ready-To-Wear, in which both brands continue to work as leading players. Saint Laurent would leave a legacy of trapeze dresses, Mondrian shifts and the famous ‘le smoking’, while Lagerfeld continues to build the Chanel empire into a multi-disciplinary creative platform. "Karl’s winning coat was daffodil-yellow and cut low across the collarbone, while Yves Saint Laurent’s cocktail dress enveloped the shoulders in a seductive black sheath"
The Secretariat Competition re-launched in 2012 under the new title of The International Woolmark Prize. The 2013/2014 finalists include Altuzarra for America, Sibling from Europe, FiXXed from Asia and Rahul Mishra from India. The designers will each show a capsule collection at an awards ceremony held during Milan fashion week next year, February 2014. This is the first year that the competition has expanded to the Asian and Middle-Eastern market, with a $100,000 prize at stake, and amid 2013's British Wool Week, we look back on the moment these two extraordinary designers won this wool-centric prize.